At the outset I want to make it clear that farmer suicides are a serious issue in this country and the agriculture sector needs reforms (not the usual rhetoric) to make farming a viable profession for the farmers. However, the unfortunate death of a reported farmer in AAP’s rally to protest against the Land Acquisition Ordinance needs to be thoroughly investigated by the police as there are some aspects about this death that appear odd and don’t add up. 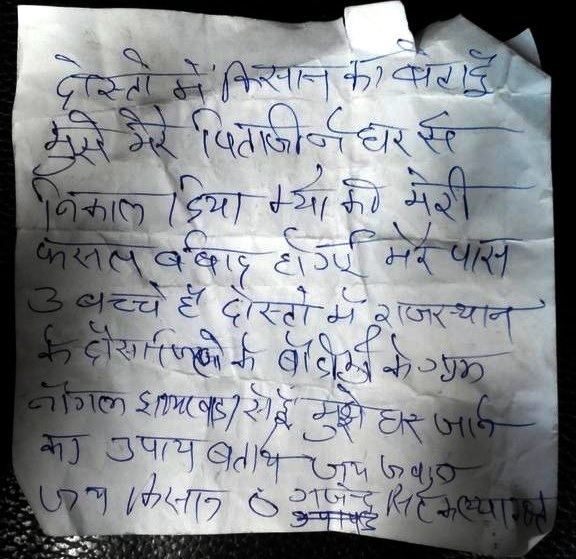 AAP volunteers are reported to have found this note that was thrown by Gajendra, the resident of Dausa who allegedly committed suicide. The note was even read out from the dais by AAP leader Kumar Vishwas while the farmer was being taken to the hospital. But this note doesn’t read at all like a suicide note. The note, purportedly written by Gajendra, says that his crop was damaged, due to which he was driven out of his home by his father and separated from his three kids. He wanted help from people in going back to his home. The note, if genuine, shows that Gajendra was looking forward to reunite with his family rather than kill himself. It is definitely not a suicide note. What changed the mind of Gajendra during the rally that instead of looking forward to reunite with his family, he decided to end his life? Why did the cops not act? Were they under orders by someone to not act? These are serious allegations on the police and need to be verified and looked into. Or did the cops feel it was just a stunt by some enthusiastic supporter? If this tweet is to be believed, Gajendra was threatening to commit suicide since morning. First of all this theory doesn’t tally with the fact that the alleged “suicide” note has no mention of suicide. So is the suicide note real? or was it an impromptu decision to commit suicide? In which case how does Rahul Kanwal’s tweet fit in? If indeed this man was on the verge of suicide from the morning, why didn’t fellow AAP supporters restrain him or take him away from the venue? Did they also feel it was all drama? And even once Gajendra fell from the tree, most probably already dead, was it right for AAP to continue the rally? Police must find out details of deceased and his family. Was he a farmer under distress due to crop failure and family problems, or was he an AAP supporter who came to Delhi to take part in party’s rally against Land Acquisition Ordinance? //platform.twitter.com/widgets.jsOne can clearly see a broom, symbol of the Aam Aadmi Party, in his hand. In these pictures, he doesn’t appear distressed or threatening suicide. 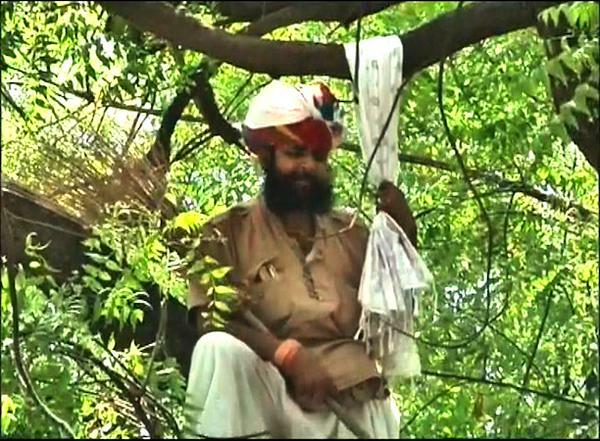 Instead he appears like an AAP supporter who climbed upon a tree and is shouting slogans. Do suicidal farmers pick up party symbols when attempting suicide? Or was it a suicide threat that went wrong? It might appear insensitive, but the police must investigate this angle. We are not new to political activists threatening suicide in hope that people around will save them. Did he put too much trust in people around him? Or was it a genuine accident emanating from a suicide threat? Some reports suggest that Gajendra was not a farmer but a small trader selling traditional headgears. He even had political ambitions and had been with BJP, Congress, and Samajwadi Party earlier. This report by IBNLive says that he wanted to contest elections and had recently warmed up to Aam Aadmi Party. If this report by IBNLive is true, does it mean that Gajendra’s activities were politically motivated and he miscalculated his steps? We can only say that at this point of time, there are more questions than answers. Hope there is a thorough investigation and the truth comes out.